It’s always easy to tell when Donald Trump is frightened by the political and legal perils he encounters. His first reaction is predictably to grab his phone and tweet out incoherent rants. They might be about issues he incompetently tries to advance, or about people he perceives as enemies. But often it’s about the media that he despises for doing their job. Let’s just set aside the baseless and deranged “Cheatin’ Obama” crap (who cheats more than Trump? Ask any of his three wives) and focus on the substance. Rasmussen is one of the most egregiously biased pollsters, well known for skewing their results to favor Republicans and conservatives. So Trump’s numbers in this poll are unreliable and far outside the range of every other pollster. The RealClear Politics average for Trump currently shows an approval of 41.8 percent, disapproval 53.2 percent. That negative 11.4 percent gap averages the latest twelve surveys. Rasmussen is the only pollster who gives Trump a positive (+1) rating. The next closest is Fox News, whose number (-7) is not exactly something to brag about. No poll (except for Rasmussen) gives Trump a rating higher than 45 percent. Gallup has his approval at only 39 percent. It’s also notable that since Trump posted his tweet, even the Rasmussen numbers have become negative, flipping to 50 disapprove. That’s one of the risks of depending on polls for your self-esteem. They change. Nevertheless, Trump is likely still wallowing in his delusional state of magnificence. However, by tweeting “Thank you to Rasmussen,” he is demonstrating that he doesn’t know what polls are. They are not favors to the subjects of the surveys and it’s peculiar to thank them for their results. 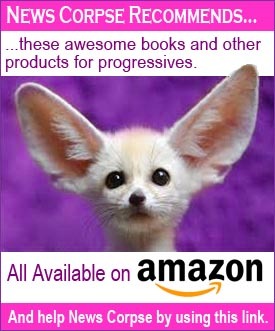 Well, maybe Rasmussen is an exception to that as well. UPDATE: Two days later, Trump dips again in Rasmussen poll. He’s now at 47% approve, 51% disapprove, with 41% strongly disapprove. Another survey that was released Monday was from Monmouth University and covered the public view of Trump and the media. Like other polls before it, Monmouth found that Americans trust the media more than they do Donald Trump. That’s gotta sting the President who has been striving furiously to turn the nation against the press. The detail shows that 48 percent of Americans trust CNN more than Trump (35% trust Trump more). Forty-five percent trust MSNBC more than Trump (32% for Trump). Even 30 percent trust Fox News more than Trump (20% for Trump). 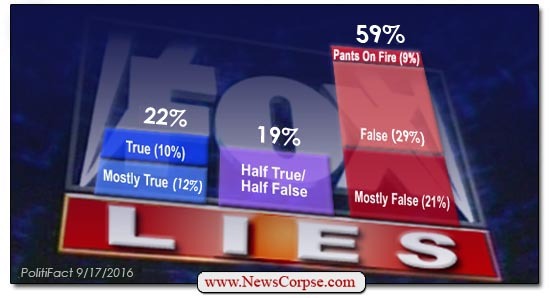 Although the Fox numbers also show that a plurality of 37 percent trust both equally. This affirms that Trump’s base is still immovably stuck in the low thirties. There are some other interesting results in this survey. 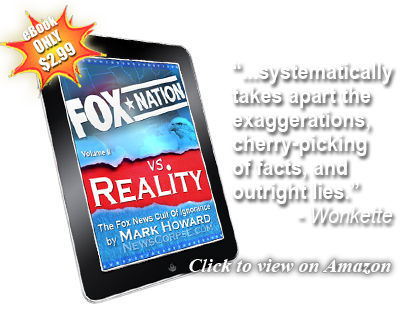 Notably the fact that most Americans believe that the media, at least occasionally, reports “fake” news. And many them believe that it is done deliberately “in order to push an agenda.” That’s indicative of the harm done by a leader who has no respect for the free press and seeks to delegitimize journalism generally in order to escape accountability. But it also makes Trump’s trust levels even worse in context. The American people still trust the media more than Trump even though they think that what the media reports is occasionally fake. Which means that they think Trump is even more fake. Let’s see if he tweets anything about that. The historically low approval ratings for Donald Trump are no longer news. It is a state of affairs that is cemented in the public zeitgeist as this President continues to flounder. The American people have made up their minds that he is an offensive blowhard whose policies reek of bigotry, ignorance, greed, and narcissism. That’s a recipe for catastrophe and given his obstinance and inability to learn or repent, there is little hope that anything will change. Let’s break that down. First of all, Trump is praising Rasmussen Reports as “One of the most accurate polls.” Anyone with knowledge of Rasmussen knows that his reputation as a pollster is toxic. His results are notoriously over-weighted in favor of Republicans and conservatives. The experts at FiveThirtyEight give him a C+, which is generous. Rasmussen polls are conducted by robocalls, a methodology that is widely discredited amongst statisticians. The only reason for his survey company to exist is to provide biased data to wingnut “news” operations and pundits. 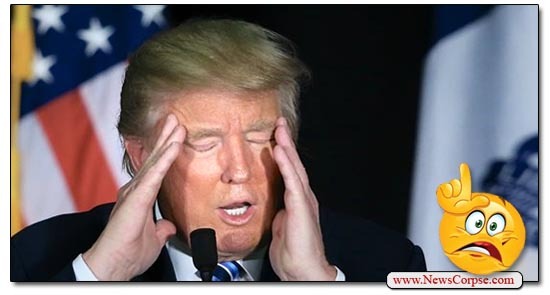 Secondly, Trump dismisses all other polls as “fake news.” It’s his typical way of avoiding any facts that don’t exalt him as the beloved Messiah he envisions himself to be. The fact that almost every poll taken by reputable survey organizations place Trump in the thirties is an affirmation of their accuracy. But Trump pulls his MAGA hat down over his eyes and plugs his fingers in his ears to prevent any exposure to the sad truth that he’s universally despised. Thirdly, Trump drops one of his famous “some people” diversions into the mix. If there is any poll putting Trump’s favorability in the fifties he should be able to cite it. Not even the ultra-right Rasmussen goes there. The only voices articulating those numbers are in Trump’s head. Finally, if Trump is so pleased with Rasmussen’s survey results he should probably make a more complete presentation of them. Then people would know that his forty-six percent approval rating has already dropped two points to forty-four. His disapproval is at fifty-four percent, hardly anything to boast about. 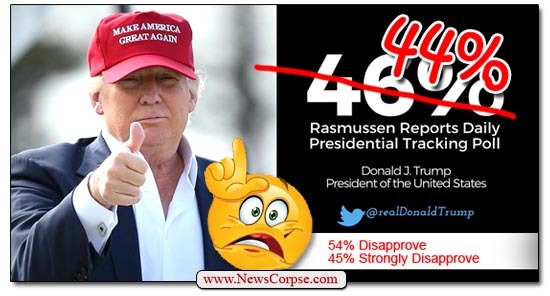 Even worse, Rasmussen tracks his ‘Strongly Disapprove” rating which sits at forty-five percent. That compares to his “Strongly Approve” rating at a pitiful twenty-eight percent. 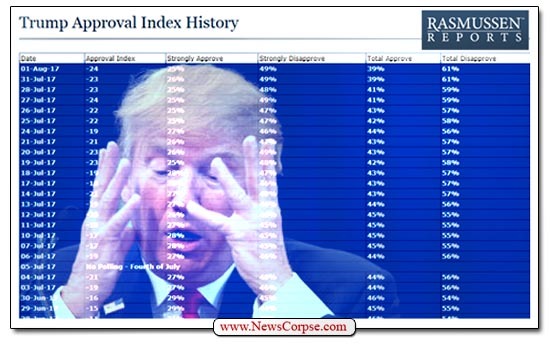 According to Rasmussen, that gives him a negative seventeen percent approval index. These are the dismal numbers that got Trump so excited he had to get on the Twitter machine and rejoice. But the only thing these numbers reveal is the depths of his psychological impairment. And his celebration of how much America hates him is just another reason he needs to be removed from office and confined to a padded cell. 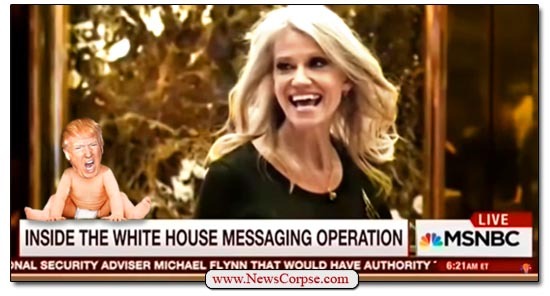 The Queen of Alternative Facts, Kellyanne Conway, has been absent from the public eye for a while. 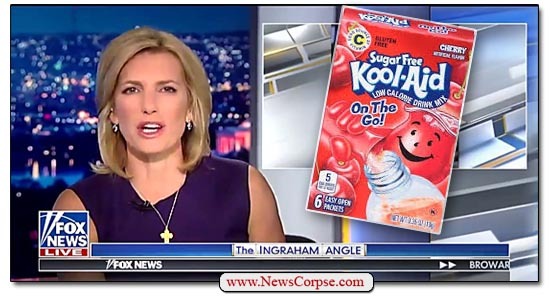 But now she has returned to make an appearance on Fox News (of course). And she didn’t disappoint in the delivery of her unique brand of shilling for her boss, Donald Trump. When reporters at a conservative paper accuse their editorial peers of being “deferential to Trump” you have a real problem. Many have them long demonstrated such deference, but apparently this editor has gone too far, even for the Journal. And they are also disturbed by his habit of usurping their duties when it comes to presidential interviews. Doocy: A couple nights ago on television, [Clapper] said he wondered whether or not the president was fit to be president, fit to serve. If James Clapper is watching right now, what’s your message to him? Conway: It’s such an absurd analysis, playing armchair psychiatrist. It’s not just him. It’s a lot of people on TV. I’m old enough to remember when news stations reported the news and didn’t just have a parade of pundits going out there and opinionating and rendering their opinions and pontificating and conjecturing. And I think it leads to analysis like this, because people end up with very little to say. They are not compelled. They are not forced. Nobody demands that they actually report facts and figures. This is way over the line. You know, the media and other opinion figures, they were way too afraid of President Obama and his administration. They’re not afraid enough here. It’s jaw-droppingly hysterical that Conway is complaining about pundits “opinionating” to the propagandists at Fox News. The “Curvy Couch” potatoes of Fox and Friends trail only Sean Hannity as Fox’s premiere Trump-fluffers. More importantly, Conway is actually advocating for some kind of government control of the press. Her notion that journalists should be “forced” to report her alternative facts is contrary to the tenets of the Constitution. She and her White House cohorts are not the arbiters of what is real or fake news. And if America wants state-sponsored reporting, they already have Fox News. Furthermore, the media should never be afraid of any president, and no president should deliberately intimidate the press. But that’s exactly what Trump has been doing. He is not merely offering criticism. His childish taunts that reporters are sick, dishonest, and bad people who hate America, amounts to overt threats. They could easily lead to violence against journalists who are just doing their job. 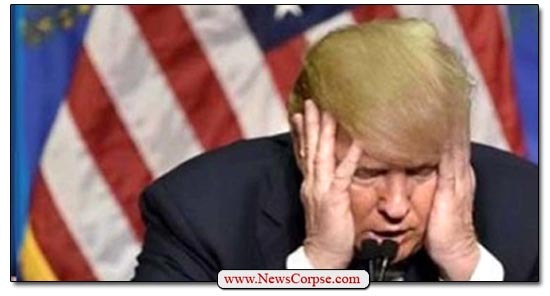 When Trump called the media “the enemy of the American people,” he effectively gave permission to his crackpot disciples to take the necessary action to defend the country from its “enemies.” Hopefully Conway and Trump will not get their wish to make the media afraid of Trump. And hopefully nobody gets hurt.